Nancy Hopkins worked on the genetics of mouse RNA tumor viruses; on the genetics of early vertebrate development using zebrafish; and on the fish as a cancer model. 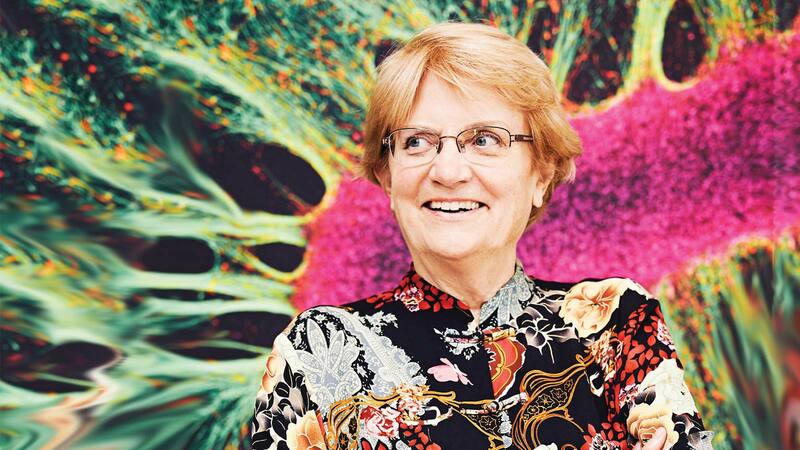 Nancy Hopkins became an assistant professor at MIT’s Center for Cancer Research in 1973. She used genetics to map RNA tumor virus genes, identifying genes that determine host range and the type and severity of cancers mouse retroviruses cause. These genes included capsid protein p30 and transcriptional elements now known as enhancers. Hopkins switched research areas more than a decade later, developing tools for zebrafish research and devising an efficient method for large-scale insertional mutagenesis. Using this technique, her lab identified and cloned 25% of the genes essential for a fertilized zebrafish egg to develop into a swimming larva. These genes included known and novel genes that predispose fish to cancer. Currently, Hopkins works on advocacy for cancer prevention and early detection research. A genetic screen in zebrafish identifies cilia genes as a principal cause of cystic kidney. Sun, Z, Amsterdam, A, Pazour, GJ, Cole, DG, Miller, MS, Hopkins, N. 2004. Development 131, 4085-93. Identification of 315 genes essential for early zebrafish development. Amsterdam, A, Nissen, RM, Sun, Z, Swindell, EC, Farrington, S, Hopkins, N. 2004. Proc. Natl. Acad. Sci. U.S.A. 101, 12792-7. Zebrafish vasa homologue RNA is localized to the cleavage planes of 2- and 4-cell-stage embryos and is expressed in the primordial germ cells. Yoon, C, Kawakami, K, Hopkins, N. 1997. Development 124, 3157-65. Insertional mutagenesis and rapid cloning of essential genes in zebrafish. Gaiano, N, Amsterdam, A, Kawakami, K, Allende, M, Becker, T, Hopkins, N. 1996. Nature 383, 829-32. Integration and germ-line transmission of a pseudotyped retroviral vector in zebrafish. Lin, S, Gaiano, N, Culp, P, Burns, JC, Friedmann, T, Yee, JK, Hopkins, N. 1994. Science 265, 666-9. Molecular mechanisms of the preventable causes of cancer in the United States. Golemis, EA, Scheet, P, Beck, TN, Scolnick, EM, Hunter, DJ, Hawk, E, Hopkins, N. 2018. Genes Dev. 32, 868-902. Reflecting on fifty years of progress for women in science. Hopkins, N. 2015. DNA Cell Biol. 34, 159-61. Highly aneuploid zebrafish malignant peripheral nerve sheath tumors have genetic alterations similar to human cancers. Zhang, G, Hoersch, S, Amsterdam, A, Whittaker, CA, Lees, JA, Hopkins, N. 2010. Proc. Natl. Acad. Sci. U.S.A. 107, 16940-5. Mutagenesis strategies in zebrafish for identifying genes involved in development and disease. Amsterdam, A, Hopkins, N. 2006. Trends Genet. 22, 473-8. A zebrafish screen for craniofacial mutants identifies wdr68 as a highly conserved gene required for endothelin-1 expression. Nissen, RM, Amsterdam, A, Hopkins, N. 2006. BMC Dev. Biol. 6, 28. A genetic screen in zebrafish identifies the mutants vps18, nf2 and foie gras as models of liver disease. Sadler, KC, Amsterdam, A, Soroka, C, Boyer, J, Hopkins, N. 2005. Development 132, 3561-72. Many ribosomal protein genes are cancer genes in zebrafish. Amsterdam, A, Sadler, KC, Lai, K, Farrington, S, Bronson, RT, Lees, JA, Hopkins, N. 2004. PLoS Biol. 2, E139. Insertional mutagenesis in zebrafish rapidly identifies genes essential for early vertebrate development. Golling, G, Amsterdam, A, Sun, Z, Antonelli, M, Maldonado, E, Chen, W, Burgess, S, Haldi, M, Artzt, K, Farrington, S et al.. 2002. Nat. Genet. 31, 135-40. High-throughput selection of retrovirus producer cell lines leads to markedly improved efficiency of germ line-transmissible insertions in zebra fish. Chen, W, Burgess, S, Golling, G, Amsterdam, A, Hopkins, N. 2002. J. Virol. 76, 2192-8.